Finally after a lot of reading, video watching and theory-crafting, I got my first game(s) of Shadespire. Ryan joined me for a game evening and we decided to give it a run out. The beauty of this particular game is that it is very quick to play so we managed to get all of our 'best of three' games played in an evening. 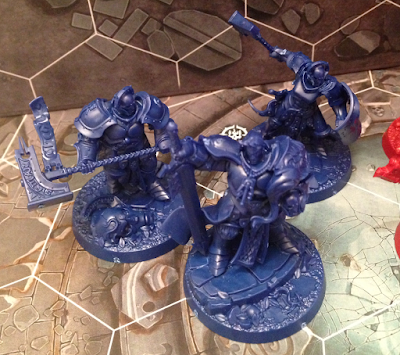 Ryan chose Khorne's Bloodbound so I took the Stormcast Eternals. As you'd expect, the first game was slow as we both walked our way through the rules – it still only took an hour! I had the distinct advantage of knowing how the rules should play, but of course things always pan out a little different once you actually get stuck in. 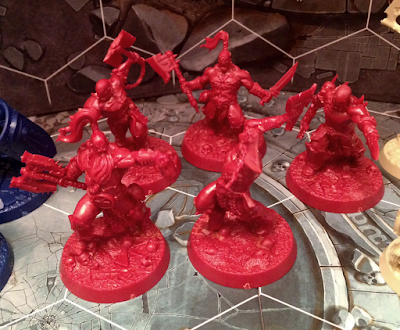 With their ability to one-shot their opponents, the Eternals quickly dispatched the Bloodreavers, 1–0 to me. The second game was much more cautious to begin with as Ryan had grasped the fact that his guys were struggling to hit so had to support their brethren in assault. Alas his ability to roll 'swords' on the dice (in complete contrast to rolling a Dodge in Imperial Assault with the same odds) was almost nonexistent. The Bloodreaver lost their second game, however, games are won by glory points not models remaining and the score was a little closer this time. Despite me having technically won the 'best of three' we continued into game three and things got very interesting. Ryan clearly had a plan, and the cards to back it up, but I had singled out his low wound characters and in a matter of minutes he was down a couple of bloodreavers. The difference this time was that he had clobbered one of my Eternals down to his last wound and another was surrounded. She too was mauled down to her last wound and managed to survive a little longer thanks to me exhausting my power card hand. She had got rid of most of her opponents and was now one on one. Unfortunately Ryan was not about to miss the chance of inflicting his first kill – rolling 3 crits!! – and it was impossible for me to avoid some damage. Not longer after my other wounded Eternal died and, after some heavy counter attacking, we were down to one man apiece and Ryan had taken a rather healthy 2 point lead. We were down to the final phase and Ryan did the sensible thing and bravely ran away, know my move of 3 would not get me within range. I had three activations I could do nothing with and the game ended with Ryan taking his first win. Excellent game evening. Very exciting. It was easy to get carried away killing the opposition but as I learned to my cost in game three, it's objectives that will win you the game. Ryan had played a very tactical final round and now has a solid handle of how things work. It will not be so easy to beat him again. For me I found the Stormcast much like the Butchers in Guildball – they kill things so easily you don't really think about the objectives. I'm looking forward to switching things up with the other two warbands I own. Lots of flexibility in the game, very solid gameplay – quite a genius little game I have to admit – and it's so quick to play!! You can get a game in 20 minutes (depending how things go of course). 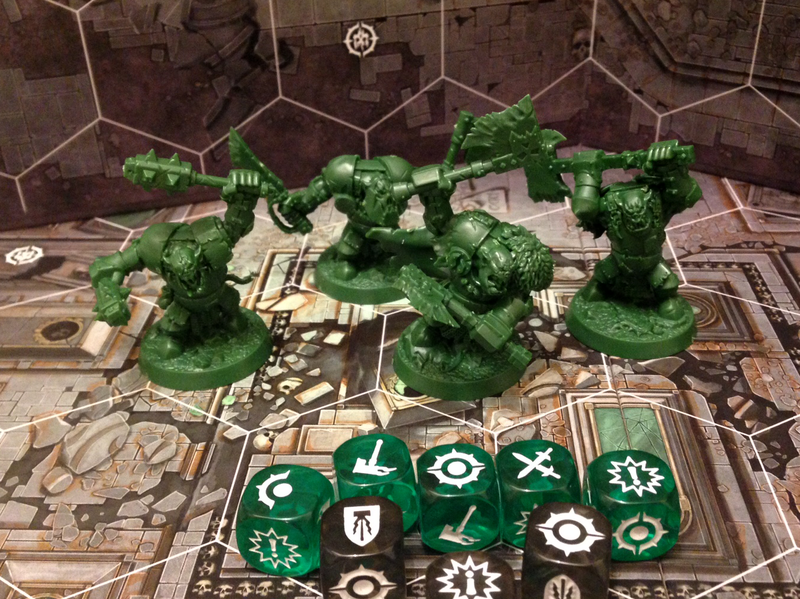 Shadespire Orcs – They're Very Green! I know I said in the previous post that there may be a new purchase soon, but even I didn't expect it within 48 hours. A fortuitous need to go to town during my lunch hour yesterday saw me drift by the GW store on the off-chance they had the Shadespire Orcs in stock. Needless to say they did, and the associated green dice, and before I knew it I had completed (for now) the set of available Shadespire warbands and coloured gem dice. Now, as you may know I am not an Orc/Ork player – never have been, never had any interest in them. Yet, whilst I was sticking them together I took in all the detail on the models and I really like them. I think the poses are a little more clumsy than the other warbands, but maybe that's an Orc thing. Bull has expressed his dislike of the new armoured Orcs on several occasions, but seeing them in their bare green plastic I began to wonder whether it was the gaudy yellow paint scheme that's put on them by GW that's putting him off. The models themselves are rather cool (I think) and if done in a black/rusty metal (i.e. traditional Ork) colour scheme they could look awesome. One of the most interesting things I discovered, having all four warbands together on the desk, was the variety in model sizes. The scale of the individual warband seems to almost be a correlation with the number of models in the warband. For example – the Liberators and Ironjawz are by far the largest models and have 3 and 4 models in their respective warbands, the Bloodreavers come next in size and have a warband of 5, then the Skeleton Guard are quite small and are 7 in number. 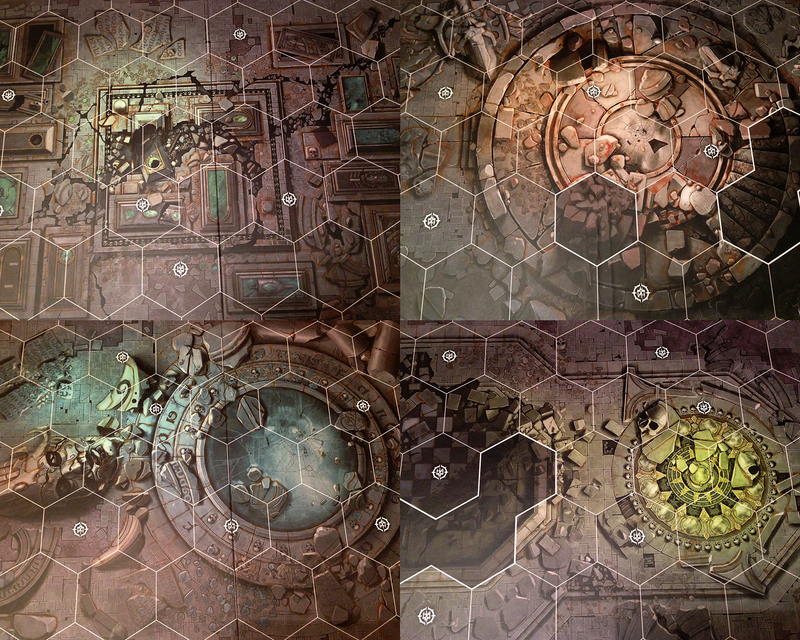 Models aside, the real star of the show is the gaming board artwork. Having compiled the gaming boards for Aetherium, I take a lot of interest in seeing how others solved problems we also had – these are very effective boards indeed. The underlying artwork is simply stunning, yet doesn't detract from the grid, it's all nicely balanced. I have to say I think the starter box is really good value at £35-40 (depending upon where you purchase), and the game itself is neat and compact both in terms of core box content and expansions (unlike Imperial Assault which is taking over my gaming cupboard). I hear two additional warbands have been announced – Dwarves and Skaven, the latter can be found on YouTube somewhere – and I was told today that there will be another Liberator warband (with crossbows?) and another Khorne warband (with a boss who has a daemon pet). To be honest, none of these really tickle my fancy, so I'm more than happy with the 4 warbands I have! Perhaps for the first time, there is nothing hobby related that I want for Christmas! Well I managed to go the whole of November without posting, mainly due to not much happening. There's been no 40k gaming since August, and no Imperial Assault since the very beginning of November. Even the buying of Imperial Assault gear has stopped as the initial 'thirst' subsided. In fact it's been a veritable hobby desert for the last four weeks. I've been doing various bits of reading, mostly about the new Necromunda, but the thought of having another box set full of 20+ models that needed building and painting made me light-headed. After an initial flurry of painting my Dark Templar Primaris marines back in October (and to be fair most of them are now purple), my painting mojo has gone – I've even sold off some of the unpainted Primaris models, including the enormous Redemptor Dreadnought. Gone too are several Zombicide Black Plague survivor models as I attempt to clean house and claw back some of the funds spent. 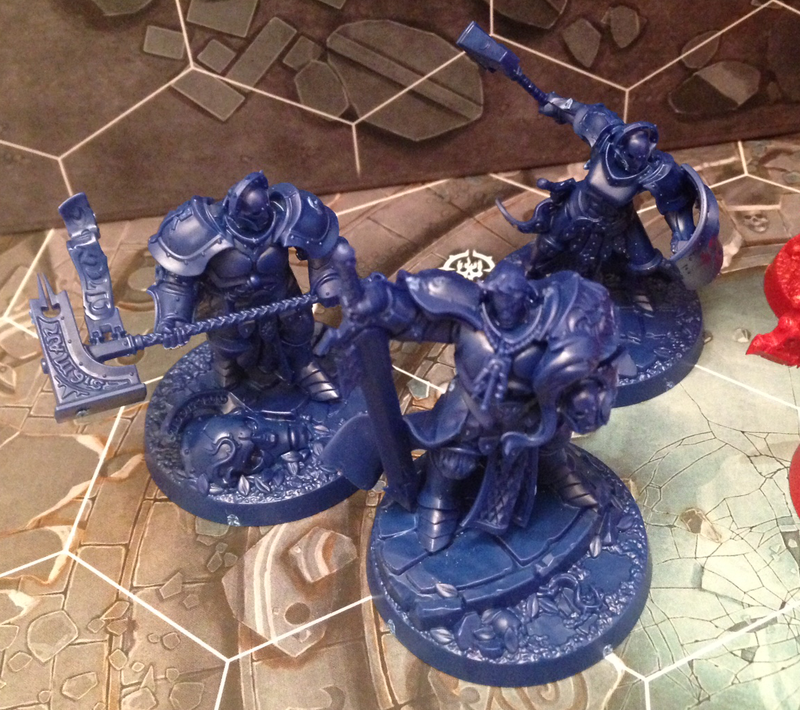 However, never one to pass on new shinies, GW's Shadespire caught my attention and I had to investigate further. 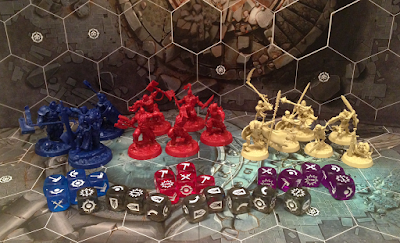 Given that the mechanics are not dissimilar to Imperial Assault Skirmish (and sums up what I've been trying to do with Dark Crucible all these years), it held my attention long enough to watch a game or two online and buy the box set. To be blunt, the models are stunning and considering they're push-fit (not that I didn't use glue myself), I'm so very impressed. Lots of character and movement – everything I've been crying out for in models for… well, decades. 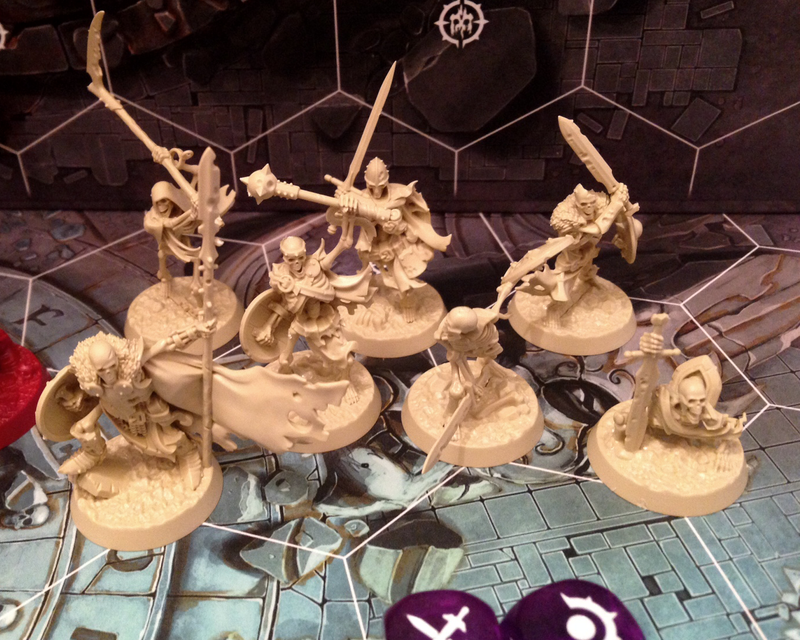 In fact I was so impressed I ordered the Sepulchral Guard expansion to get my hands on more. Of course I had to have the corresponding coloured dice – call it a Christmas present to myself. Games Workshop really do have the quality and presentation thing sorted – in that respect they are the Apple of the gaming industry. 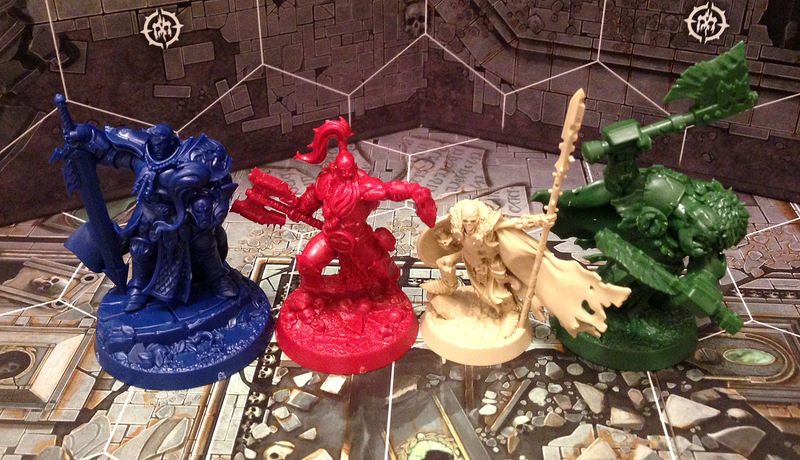 I don't know if I'll ever get to play Shadespire, but I like the idea of the mechanics and I love the setting, game board art and the models. I always wanted to dip my toe into the new-look Warhammer AoS without investing lots of money and time – this may be the solution. I am still missing the Orks expansion, mainly because I've never bought Orks before it never entered my head! Don't be surprised to see another expansion purchase soon! A Tale of 3 Painters… For Charity! Ghools’ Zombie T-Shirts, Some News on Videos, and More! A welcome change. Lord of change showcase. "We who are about to die..."
Mark's wargaming - anything but a one! Miniature War Gaming | "How to fully subjugate your enemies…"